The Death of the paper gold market picked up speed today as Blackrock announced that issuance of new Gold IAU ETF shares was suspended. However, it’s much worse than the information in news release when we factor in the total supply and demand situation. Now, why is this so interesting? Because, this now suggests a tightness in the paper gold market due to the last several years of surging physical gold demand…. especially now that China has recently become an “official” Central Bank buyer of gold. 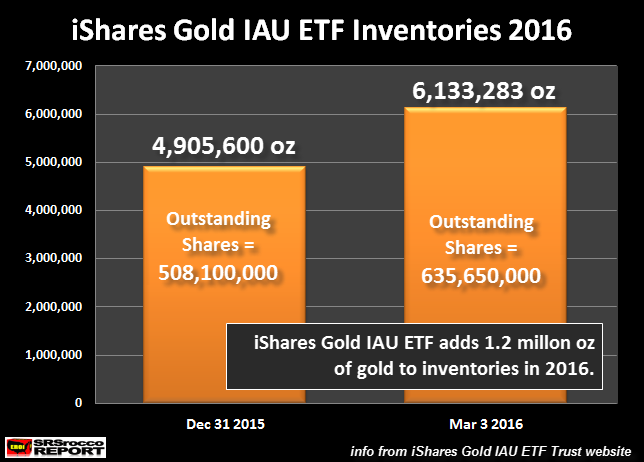 The iShares IAU ETF held 4,905,600 oz of gold at the end of 2015, but this jumped 1.2 Moz to 6,133,283 oz presently. 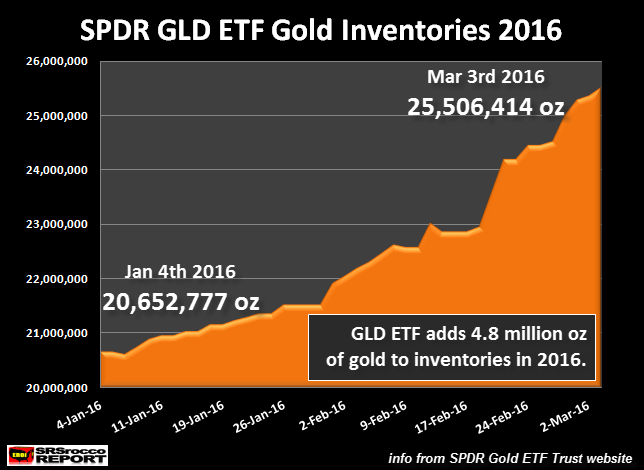 This is nearly a 25% increase in gold inventories in only two months. As we can see, the outstanding shares increased from 508.1 million Dec 31st 2015, to 635.6 million shares currently. February marked its largest creation activity in the last decade. This surge in demand has led to the temporary exhaustion of IAU shares currently registered under the ’33 Act. We are registering new shares to accommodate future creations in the primary market by filing a Form 8-K to announce the resumption of the offering of new shares. Blackrock says they are registering new shares to accommodate future creations in the primary market. The question to ask is this….. why wait until shares are exhausted before filing a 8-K form to acquire additional shares? Is it just a matter of getting new paper shares, or is it a matter of acquiring the physical gold to back those shares? While Blackrock’s has suspended issuance of new shares of its IAU Gold ETF, SPDR’s GLD ETF has added a whopping 4.8 Moz of gold to its inventories in the past two months–four times the rate of the IAU Gold ETF. Could it be that the GLD ETF has no problem acquiring physical gold because it really doesn’t contain all the gold it says it has in its inventories? Or maybe the gold they say have in their inventories is over subscribed? The GLD ETF had 20.6 Moz of gold in its inventory in the beginning of the year, but now holds 25.5 Moz. Just these two gold ETF’s have added 6 Moz of gold to their inventories in just the first two months of the year. This is an amazing feat when we realize total mine supply was likely only 14.5 Moz for January and February. If the gold market suffered a 1.4 Moz deficit in Q4 2015 even with 2.2 Moz of supply coming from Gold ETF outflows, what kind of trouble is taking place now with just two Gold ETF’s added 6 Moz to their inventories in just two months??? 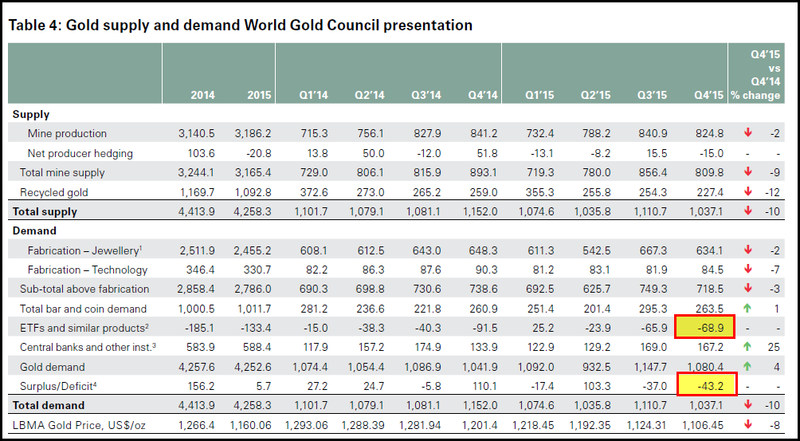 Folks, this translates to 187 metric tons of additional physical gold demand during JAN-FEB compared to a 2.2 Moz outflow last quarter. This is an amazing net 8.2 Moz change in Gold ETF demand in just the first two months of 2016 versus Q4 2015. No wonder Blackrock had to suspend issuance of new shares. We may be finally witnessing the REAL ENDGAME TO PAPER GOLD MANIPULATION. It will be interesting to see how things unfold over the next few months as more cracks continue to appear in the Greatest Financial Paper Ponzi Scheme In History.